Apple has hinted at what its plans for a video streaming service could be, by revealing its ideas for an Apple TV interface that provides scheduling information, the filtering of content based on a user's needs, and being able to subscribe to on-demand services directly from the interface. 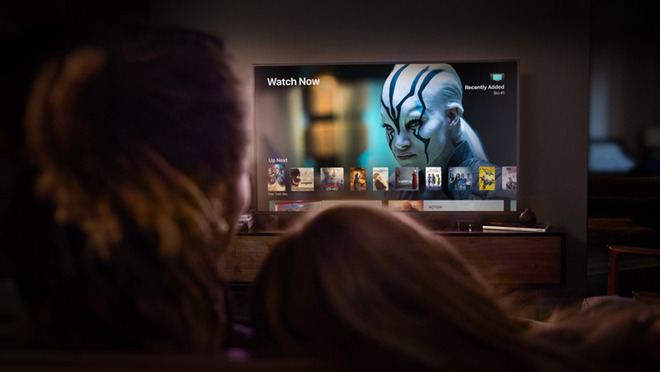 One of the main challenges of producing a video streaming service or a set-top box that is meant to work with live television is the interface. Arguably one of the most important elements, especially for cable and satellite TV services, the ability for users to see all of the available channels and to decide what to watch is extremely important, and in some cases, can make or break a service. It is evident that, while Apple already has considerable user interface experience in the field with the Apple TV and tvOS, it is still considering ways to improve it. 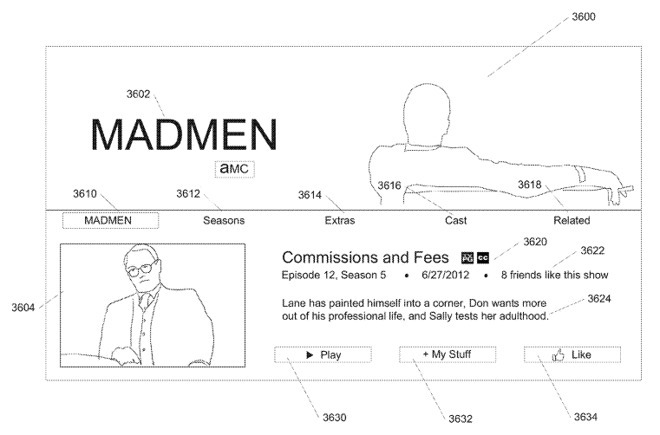 In a filing published on Tuesday by the United States Patent and Trademark Office, the patent for a "TV side bar user interface" offers hints as to where Apple thinks changes could be made to the usual TV UI layout. In short, Apple suggests the use of a side bar that can be used to drill down to specific categories and types of content. 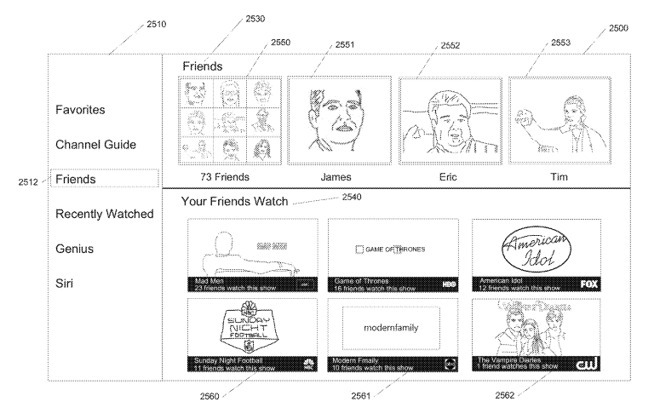 According to the patent, the interface could be used to manage content from multiple sources, such as a variety of existing online video streaming offerings from major channels, pay-TV versions, or non-broadcast video services like Netflix and Amazon Prime Instant Video. As Apple notes, "while the explosion of video content providers in the marketplace may seem a boon for viewer's, the large number of choices and providers complicates the viewing experience." The interface would acquire details of the available content from each of the providers, including relevant metadata that identifies the network, format, duration, and so on. 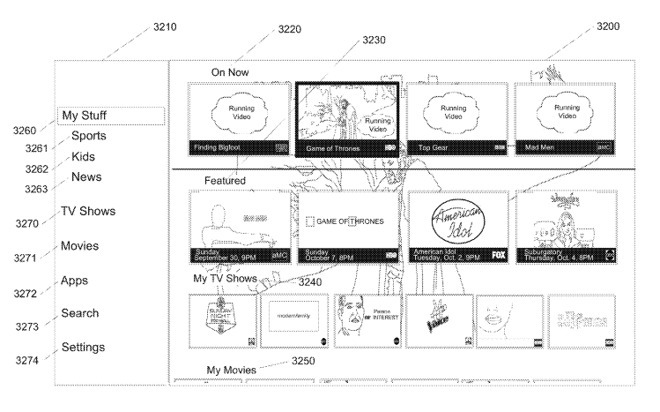 With this aggregated content, the patent advises users could select a show from the list, and be taken to a landing page offering multiple seasons and episodes of a specific TV show, or in the case of a sports team, other content that features players or games they played in. These same landing pages will also offer alternative content options, "identified through crowdsourcing." The title of the patent is the most notable element, as it is used to determine what kinds of content could be provided to the user. In one example, the side bar includes a list of items including Favorites, Channel Guide, Friends, Recently Watched, Genius, and Siri. As to be expected, Favorites would provide a list of shows that the user has previously watched, in order to quickly access the next episode without going through the main listings. The Channel Guide brings up what seems to be a fairly typical schedule-based interface, with options to "watch now" some shows. In cases where there's a show that isn't available to the user, an option to "subscribe" may be presented in the interface, which can lead them to sign up to the relevant service to access that content. The Friends interface brings up a list of the user's contacts who are sharing their own viewing habits, with individuals able to be selected to see what they have recently been watching. A second lower section within the category shows content that a user's friends are watching at that moment, with the most popular items being at the top of the list. In another view, showing a user's general content, the side bar divides up into TV Shows, Movies, Apps, Search, Settings, and My Stuff, which is also divided down into subcategories, including Sports, Kids, and News. Generally, Apple submits a number of patent applications on a weekly basis, but while the existence of a patent suggests areas of Apple's interest, it isn't a guarantee that the items shown will appear in a future product or service. Apple has been working on a push for original video content for some time, including spending at least a billion dollars on the project so far. It is thought that the first shows from the effort will make an appearance in the next few months, but it is still unclear how it will take form. It has been suggested there could be a subscription streaming service bundle with Apple Music and other content, while there has also been the suggestion it could be a free perk for Apple-device owners, with third-party subscription-based streaming services offered alongside it. While the project remains a partial mystery, Apple CEO Tim Cook did reaffirm the company's commitment during a conference call for its most recent quarterly results. As well as affirming a commitment to the Apple TV, Cook hinted towards its original video content plans. "We will participate in the original content world. We've signed a multi-year partnership with Oprah," Cook said. "Today I'm not really ready to extend that conversation beyond that point. We've hired some people we have a super amount of confidence in. They're working on that really hard. We'll have more to say on that later." While the potential service could involve accessing streaming services from other content providers, at one point there was the possibility of Apple offering the streams directly. A few years ago, Apple was reportedly in talks to create just such a service, but evidently it decides against such a move, in favor of creating its own original content. Isn’t most of this already done via the TV app on iOS or am I missing something? I like the friends sharing. It’s something we do over casual conversations but this might add to that experience. A couple of things keeping us from using the TV app is it’s lack of deep integration with Netflix and it’s ability to address multiple peoples viewing habits. This is essentially where we are with the music industry now with Music or Spotify. The last one will require the provider to archive all streaming channels for some period of time (say 24 hours), thus allowing anyone, at any time to stream back a few minutes or a few hours. This provides the opportunity to rewatch a portion of a sports event or stream in case the viewer is interrupted or simply needs to see it again. NO provider now does this and it will require a large infrastructure to achieve this, but it will set Apple apart it they could do it first. All of these features would require the above DVR first to allow these to be implemented. I like the friends sharing. It’s something we do over casual conversations but this might add to that experience. Yeah I liked this feature when Netflix used to have it — via their website you could see what your friends were renting, and send reviews to your friends. But right before social media became a thing, Netflix killed it. Netflix used to connect to Facebook around 2012. Looks good as the new TV App (not that most countries even get access to the old one). A more important requirement would be the tvOS App rules change which force providers to integrate with it rather than providing a shoddy AndroidTV (Hulu) or Windows10 (Netflix) UI. 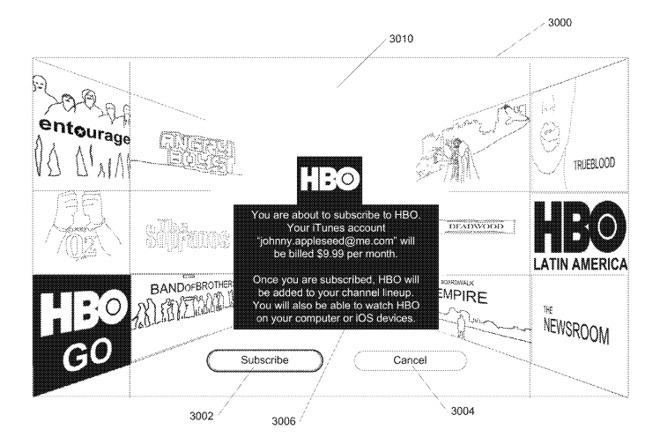 They should also pull Apps with non-standard search screens - HBO is awful! Sorry Tim but the future of TV wasn’t Apps, it was plug-ins. Sharing shows or movies of interest with friends is indeed enjoyable. But I have the exact opposite take as you, because when services start sharing very personal information like that with other services ("deep integration"), that's when I stop using them. Or more commonly, never start. If you think this kind of sharing is innocuous, I'd suggest reading more about how psychological profile data like this is being weaponized, worldwide. Less so, when single-sourced from a small-ish company, but more and more so as the data sets become huge and/or integrated across services.